No Miss Antifungal Fungus Killer is a non-greasy topical solution used in the treatment of nail fungus. Clean affected area with warm soap and water. Thoroughly dry area. Apply one drop at free edge of nail twice daily. On a website, I found No Miss for as low as $5.85 a bottle. I found no mention of a Money-Back Guarantee for No Miss Antifungal Fungus Killer . 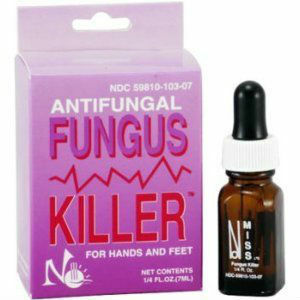 No Miss Antifungal Fungus Killer is a mild treatment for the relief of nail fungus. Because the active ingredient is mild, you may have to use a longer period of time than some other products. With a price of $5.85, and no money back guarantee, No Miss Antifungal Fungus Killer may be a lengthy solution to your fungus problems. Many reviews mention having to use this product up to one year and some with the addition of another product just to see improvement. Jack Stevens	reviewed No Miss Antifungal Fungus Killer	on June 14th	 and gave it a rating of 3.